"A few years ago when I was teaching preschool I discovered that I could learn to see the children’s perspectives in very powerful ways if I observed them closely and then tried out what they were doing. I had been frustrated with a group of boys who had taken to zooming the small cars off of block ramps that they built. They would fling the cars across the tilted ramps, watching them fly through the air, hitting the ceiling, the windows, and sometimes people. I spent a lot of time trying to stop their behavior, but to no avail. "After the boys left one day, my co-teacher and I decided to try out the cars and ramps ourselves. Much to our surprise we had a blast! We experienced the excitement and challenge as we built the ramps and zoomed the cars. With this new perspective, we approached the children’s work in a very different way. We offered the boys challenges to build their ramps more carefully and control the speed more accurately. They took up our suggestions and the activity became a focused, complex learning experience for all. Since then, trying out what they are doing has become a regular practice for me to see children more clearly." "When you come to this Blessed Book, the great point is to come with a deep consciousness of your ignorance, seeking on your knees the help of God, that by his Spirit he may graciously instruct you. If you do not understand some portions, do not be discouraged, but come again and again to God, and he will guide you little by little, and further instruct you in the knowledge of his will. And with an increasing knowledge of God obtained in a prayerful, humble way, you will receive, not something that simply fills the head, but something that exercises the heart, and cheers and comforts and strengthens you inner man." George Muller was a 19th century evangelist and coordinator of orphanages in Bristol, England. He lived an incredible life of faith and ministry to the poor. If you are interested in learning more about him, I recommend his autobiography or, for an easier read, George Muller: Man of Faith and Miracles. This week, I am thankful for the great men and women who have lived before me, who have demonstrated amazing faith and wisdom, and have struggled through deep truths. I am who I am because I can stand on the shoulders of these giants. As protestants we sometimes forget the very challenging work of the church fathers to "rightly handle the word of truth." Throughout our history as the body of Christ, there have been questions about who we are and who God revealed himself to be. These courageous men and women struggled through these questions and have established the truths of the Christian church. As one example, imagine how very differently we would view ourselves if the gnostic beliefs had not been checked in the early church. We would believe that the physical world was evil and worthless, and only the spirit mattered. While we do hold to the importance of the new life we have in the spirit, we can also enjoy the beauty of the physical world -- the ocean, the sunset, the hugs of our children -- as part of God's good gifts to us. So today I echo the statement of Sir Isaac Newton, "If I have seen further, it is by standing on the shoulders of giants." Join me in being thankful this week. Every Thursday you can enter your Living in Thanksgiving post at Blue Castle. The sun came out for a little while today, and Joshua's class got excited about the shadows they discovered during circle time. 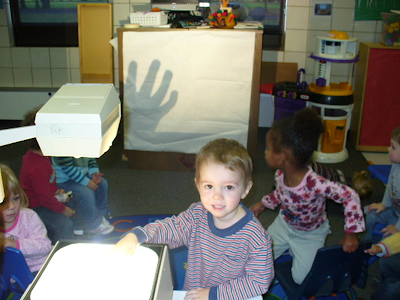 So, his teacher set up the overhead projector and they spent the morning exploring shadows. The kids loved it! 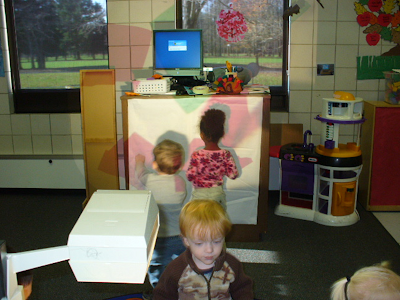 They explored colors and toy shapes; and some of the girls put their pony tails on the projectors. Joshua enjoyed creating shadows with his hands and fingers. He came home for school telling me how much fun he had with Miss Bela and asked to go back for more. How, O Lord, can I have hope when this world is such an insecure place? What, O God, is reliable? What is secure? I fear, Lord, that evil will win out in the end. I worry that my efforts will be for nothing. I feel overwhelmed by powers beyond my control. You alone, O Lord, are my hope. You alone are my safety. You alone are my strength. May I -- even with my fears and anxieties, my insecurities and uncertainties -- swing like a needle to the pole star of the Spirit. When Green isn't Black and White! I have been thinking a lot about "going green" lately, and what small changes I can make in my family that will have less of a negative impact on the environment. However, I have found many times when green just isn't black and white. Styrofoam is not recyclable (as far as I have found) so it has to be disposed of somewhere. On the other hand, plastic cups are most of the time recyclable, and paper cups are normally biodegradable; they are both much heavier than Styrofoam, however, and consume more gasoline to move them to their distribution center. So, if forced to choose, which one is really "greener"? Paper napkins are disposable and biodegradable; they create waste, and they use our tree resources. Cloth Napkins, however, require regular washing, using valuable water, and creating waterborne waste. So which one is "greener"? What if you use paper napkins that are made from recycled paper? I know these debates don't have black and white answers. Most of the time they answer is dependent on local conditions. In the U.S. we have great water treatment plants, and plenty of fresh water, so we don't tend to worry about using water. Either way, though, there is a negative impact on our environment. What do you think? What are some areas where you have had to try to choose the "greener" of several options? For his physical therapy session this week, Joshua got to drive Abigail around in the laundry basket to build strength in his abs and legs. Lord of the Flood, wash us with your Spirit that we may be your ark of life, your peace in the sea of violence. Water is life; water cleans; water kills. Frightened, we are tempted to make a permanent home on the ark. But you force us to seek dry ground. We can do so only because you have taught us to cling to our baptisms, where we are drowned and reborn by the water and fire of your Spirit. So reborn, make us unafraid. Abigail loves her shaky egg. Its just the right size to hold in her hand and when she excitedly shakes her arms, it makes a great sound. Today, Abigail was sitting on the couch with me holding the shaky egg in one hand and a maraca in the other. Joshua went and found the other egg and another maraca then asked for some music. We listened to "I Know a Chicken" by Laurie Berkner, and everyone got to shake their eggs. Abigail watched Joshua so intently, holding her egg in her lap. When the chorus came on, Joshua would start shaking his egg. Then Abigail would laugh and shake both her arms as fast as she could. It was so funny and so sweet! Abigail adores her big brother! Last week when I went to get Abigail up from her nap, she was cheerfully STANDING UP in her crib. This was her first time pulling up to a stand on her own. She is now so excited and stands up every time she has the chance. Joshua was a much more cautious baby and was less accident prone. Abigail just launches herself into everything she can, with no regard for her safety. She has had her share of bumps and bruises, but nothing serious. Joshua has found this new phase very frustrating. He use to put all his toys on the table, so Abigail couldn't reach them. Now she can reach all the table tops. Oh, the challenges of being a big brother! I was inspired this year to host a little party for a bunch of the neighborhood kids on Halloween. There was a great turn out and everyone had so much fun. There were treats, crafts, games, and prizes. And all the little kids were so cute in their costumes! Joshua helped me fill some bottles with colorful water and soap suds for a game similar to bowling. We filled our little water table with birdseed and buried little toy lizards and frogs. This was a big hit with the younger kids. One of our friends brought a pinata for the kids to break open. Joshua didn't want to take a turn until he saw how much fun everyone else had swinging the broomstick. Joshua got a little bottle of bubbles from the pinata after it was broken. John chapter three is an incredible introduction to the new life we have in Christ. This is a very familiar passage of scripture. I was challenged to read it with fresh eyes, without reading all my opinions into it. We have become so use to the term "born again" and "be saved". They have become very strong, polarizing terms in our current culture. Take a step back and see what the text actually says; think about what this must have meant to the first century church. Jesus is challenging the idea of the Kingdom of God being a physical realization for the Jews. Instead, you must be "born from above" to enter the kingdom; you must be born "of water and the Spirit". In this chapter, we also begin to see the idea of God's mercy and love overcoming the condemnation and judgment sometimes associated with the holiness of God. John has yet to stress the forgiveness and restoration of the new life, but he makes it very clear that God's purpose is to save, not condemn. This is the first time John describes the new life as being "saved". This is placed in the context of a story of salvation in the old testament - Numbers 21:4-9. The Israelites are dying from snake bites. God instructs Moses to place a golden snake on a high pole in the middle of camp. Everyone who looks at the gold snake will live. What a strong picture of salvation! I enjoyed the challenge of rereading this chapter with a fresh perspective and considering how the ideas of birth and new life were understood by the original readers. Lions and Zebras and Bears! Oh My! We had a fun Halloween this year. Joshua is getting old enough to really enjoy dressing up. Joshua was a zebra this year. He was so excited about his costume. He wanted to get dressed up long before the big day, and for several days after. Abigail was Winnie the Pooh. She was so cute and sweet! Though she was more excited about the Cheerios, than anything else.